To avoid any misunderstanding of this article's title, there is nothing illegal or hidden going on; it is about a real colossus with the staff and power to exhaust any and all available means to increase its profitability. For about two months we closely followed the way in which Booking.com handles a part of its advertising campaign on Google Adwords. Beyond the ad campaigns at destination level (hotels in Athens, hotels in London etc) they create campaigns at hotel Brand level too. 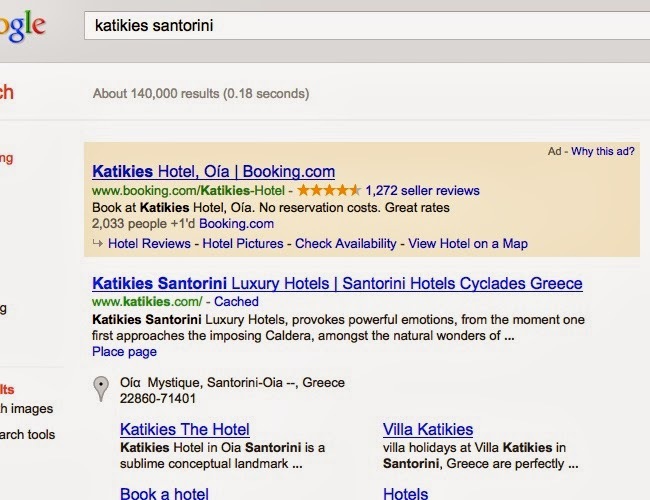 Searching for Hotel Katikies in Santorini, Booking.com comes first in the ads frame and comes under the official site of the hotel. The displayed ad is absolutely targeted with optimized title, address, description and of course by clicking it you are driven to the registration page of the specific hotel on their website. 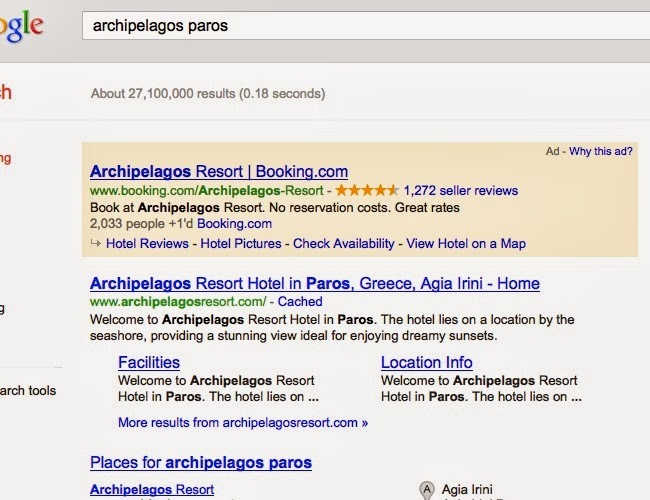 The same exact description appears not only for the hotel Archipelagos in Paros but also in every hotel they advertise. 1. 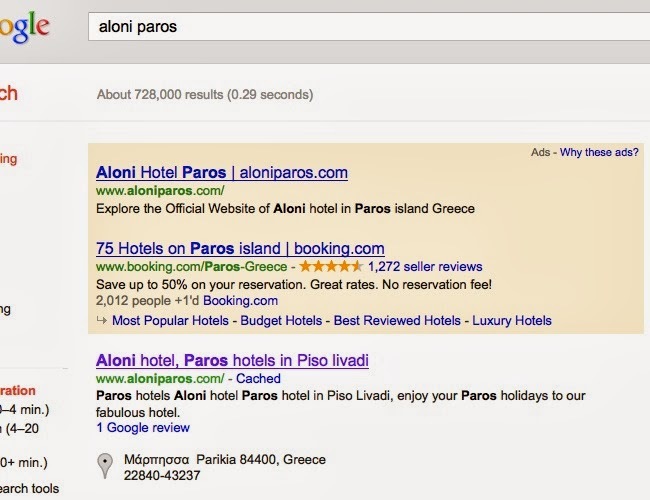 Cost: Keywords that are geographically based such as ‘Athens Hotels’, ‘London Hotels’ cost in most cases more than €1 and often over €1.5 euro per click. Out of 100 clicks the cost is approximately €100-150. Out of these clicks if there are three reservations with 15% commission each, it is unlikely they pay for their expenditure. In the case of advertising at hotel level, the cost drops to €0.20 to €0.30 per click. Clearly in this case there are fewer visits, however , there are key advantages; the cost of advertising is reduced, there are more targeted visits (because customers behavior when searching for a hotel in general is different to when they are search for specifics) they grow conversion rate and therefore profitability. The fourth step is the secret that Booking.com takes advantage of. Apparently visitors do not know the hotel’s precise website and it is for this reason they turn to Google. 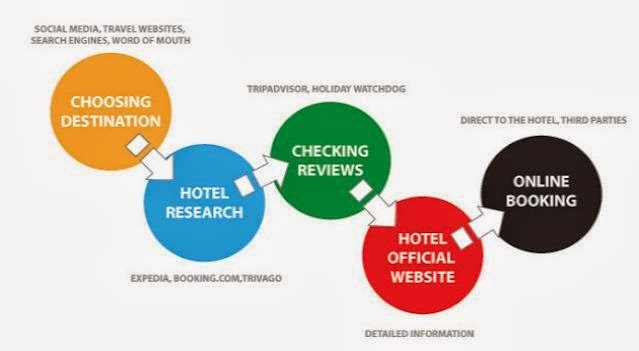 Users search the name of the hotel on Google on many different occasions as well as the steps listed above, for example after seeing ads in magazines, hearing from a friend (word of mouth,) advertising on TV or radio or other avenues. Within a period of three months the recurring ad (which always provides return and in no way goes over the set daily budget) had 4,300 views and a significant number of clicks, some of which would previously have been lost because of Booking.com. Even now we lose some clicks because of the sum of the clicks we get from the advertisement and from the first organic result that is exactly below the advertisements and is NOT 4.300! The cost of the campaign so far has not exceeded €80. Of course this cost is relative with the season and with the number of searches that a hotel has. If we consider that Booking.com is advertising about 100,000 hotels, we can assume it achieves at least 430 million views as a result of this strategy every three months. That means at least one billion views per year. Some hotels are more searchable and the study is not happening in a peak period. The number of bookings from this strategy is high with a very good rate of profit in relation to advertising expense and led to direct bookings through the hotel’s official website. Many online travel agencies are starting to follow this strategy, since the number of suppliers is shrinking, margins are slimmer and there are continuous efforts to find cheap targeted keywords. So whatever the Marketing Mix of a hotel, it is good to always run an active google adwords campaign with keywords for the specific hotel name. It is much cheaper than paying commission to third parties.